I was recently doing some testing and I could not get damage shown to match numbers. 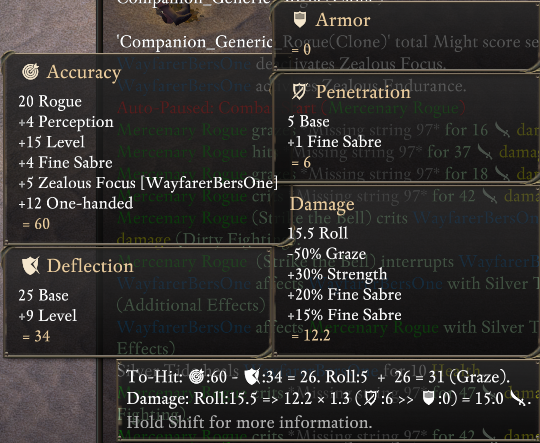 I was under the impression that no penetration gave a negative bonus similarly to how damage bonuses, apart from lashes, are additive. I can not get the numbers to add exactly but it seems that no pen uses a .25 multiplier to base damage, then the game takes the .75 penalty again to reduce bonuses additively before multiplying for a final damage total. The math doesnt work that way, look up "inversion", for example here. Thanks, I did not know this guide existed. 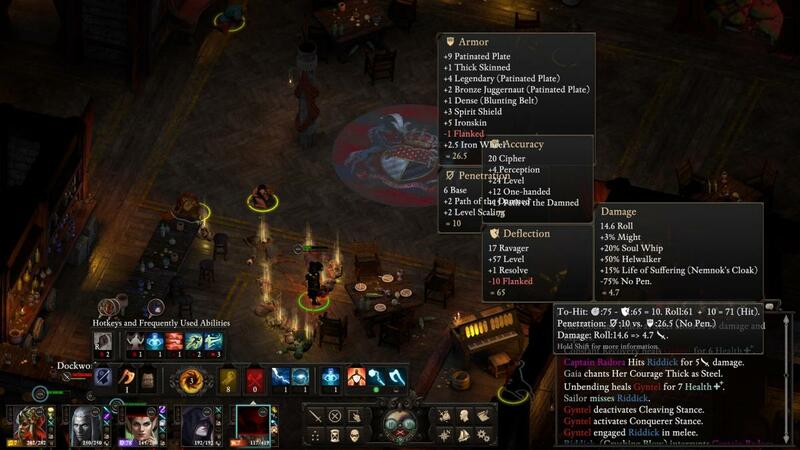 I wish obsidian was a bit more clear on how stuff worked. Those, I think, are the perils of creating RPG rules from scratch. Wording, comprehensive descriptions, overcomlicated solutions, all that stuff that gets better with time spent polishing. It's a really elegant solution though! Shame it is so hard to communicate a -300% damage mod or this would be a lot simpler. It's a really elegant solution though! The best thing about current system though is: that modifiers are handled in additive manner (to each other), but kinda emulate the multiplicative effect (e.g. -50% from graze can be "countered" by a +100% damage bonus). The worst thing about current system is: that it just creates a lot of confusion due to this double inversion, and adds some doubts if the computations reflect the situation in the correct manner, once there are 2+ maluses and bonuses in it. Shame it is so hard to communicate a -300% damage mod or this would be a lot simpler. "-300% damage" - i.e. 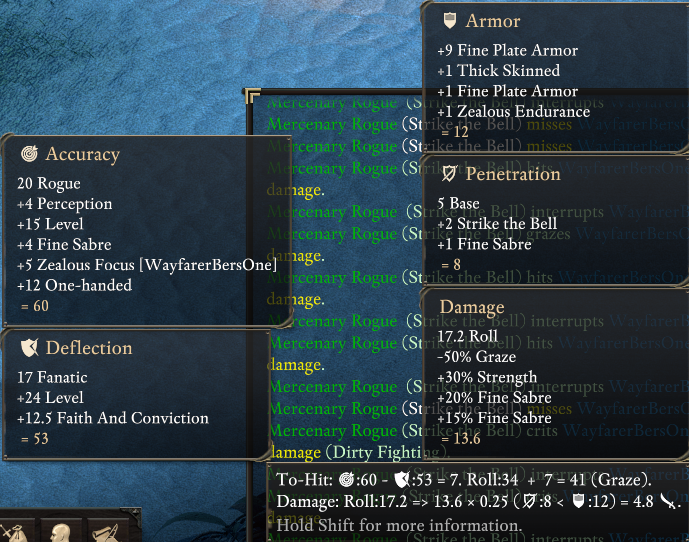 a modifier to base damage that is handled in additive manner and decreases damage to zero, unless you counter it with a 201+%? If so... yeah, in Deadfire and majority of games (that don't use straight additive approach) you can't express that. - when you graze you deal x2 less damage than when you hit. - if you underpenetrate - that's a strict x1.33, x2, x4 damage decrease, comparatively to normal penetration. 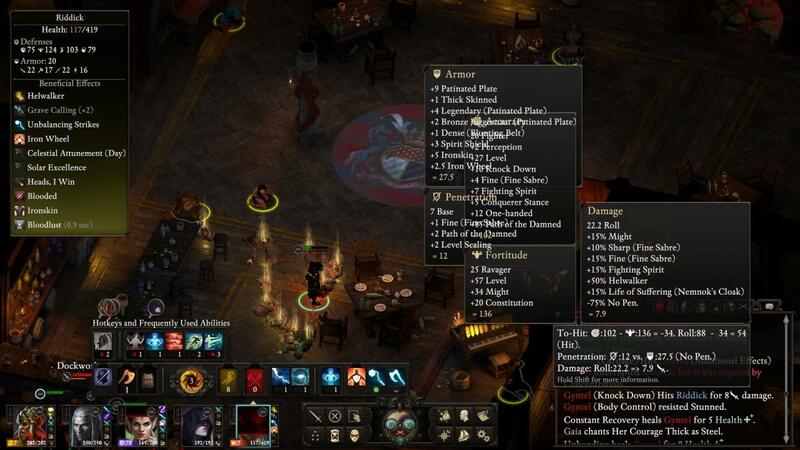 - power level and weapon quality (fine, exceptional, etc) damage bonuses - provide the same relative increase no matter what might you have, or do you have sneak attack or not. Yes, elegant. In a system with compounding effects our standard approach of arithmetic and geometric percentage changes is really poor. I like the way they handle the math under the hood a lot. It splits the difference between a more natural Platonic scaling system and a more cleanly understood geometric system; unfortunately it gets counterintuitive when you start stacking positive and negative modifiers. You can reproduce some of the same effect with a combination of multiplicative and additive bonuses and maluses, for sure - but then you have an additional layer of complexity to communicate, and you don't really solve the problem of how to handle maluses (your system only handles multiplicative maluses). That they didn't finish squaring the circle didn't help either - their power level scaling outside that system is a clear systems mistake. But their double inversion approach is really clever. One of the best solutions I have seen. Cleanly handling all modifiers with the same sign additively, but of opposite signs effectively multiplicatively, gives you a system that won't blow out but also maintains high impact of individual modifiers. Edit: Oops posted in the wrong thread, instead of referencing it.